My latest financial splurge has probably been the most sensible expense I’ve ever had. Night school. At the end of September I embarked on (part time) student life, spending Tuesday and Wednesday evening in Illustration class & Figure Drawing class (after parting with £420 of tuition fees and £80 for art supplies- ouch!). I have had something really fun to focus on, and have generated lots of work for my portfolio (more on than another time!). I’m fortunate that my employers encourage learning and offer subsidies to those who wish to study, even if it’s not directly related to work, so I can claim 50% back on completion of the course (to the value of £250 per year). Another great discovery for me was the ILA (Individual Learning Account), available to low earners residing in Scotland (terms are at http://www.ilascotland.org.uk/What+is+ILA+Scotland/Eligibility.htm ). The purpose of an ILA is to provide up to £200 per year for a variety of courses, or £500 for a course towards a higher education or professional qualification. ILAs are available for people with an income of £22,000 a year or less, or those who are receiving benefits. Sadly it is no longer available to those living in other areas of the UK – sorry guys! Fortunately or unfortunately, my annual pay falls into this lower category (hence, the need to budget) so it looks like I qualify for this kind of grant, which is fantastic news as I am already planning to book the next term! Is there something you’ve been thinking of studying? Whether you fancy brushing up on your IT skills, or maybe baking cakes is more your bag, it might be worth looking into what funding opportunities are available to you. Maybe your employer would help fund a course? Particularly if it is beneficial to the company you work for. Learning can really lift your spirits, and in these time of recession, I think we could all do with a little pick me up! For me, these courses fit into my grand plan, and sometimes you’ve got to spend money to make money, right? I’m now into my fourth week of feeling unwell and, although the sore throat (which turned out to be tonsillitis- ouch!) has subsided, I am still well & truly under the weather. That said, I’m conscious that I have still to share the next instalment(s) of my comparative noodle eating. So, here goes. My second noodle was one of these lesser known brands called Shanghai Garden. I opted for the chicken flavour, although curry flavour was also available. They are the second cheapest from my Tesco shopping list at just 18 pence. Again, I followed the instructions to the letter and noticed that this brand required a lot more water, 300 ml rather than just 200 ml for the Tesco value range. Then I realised that you actually get quite a lot more in the packet – 108 grams versus only 65 grams on the Tesco Value noodles! After waiting a moment or two for the cogs in my brain to turn, I worked out that the Shanghai Garden noodles are (only a little bit) cheaper than the Tesco Value noodles when priced per gram. They also taste better and the consistency is more pleasing. Okay, there’s not a huge amount in it, but if you were on a tight budget (let’s face it, most of us are! ), then you could actually stretch this to two meals, or to feed two people as suggested in the instructions. The following day, I opted for the Tesco standard brand noodle (for those who shop elsewhere or who live outside the UK, there’s Tesco Value, Tesco, and Tesco Finest, although they don’t seem to make any Finest instant noodles!). Knowing what to look for following my previous tests, I noted these were 85 grams and cost 28 pence. The price per gram is almost double that of the previous two, so the expectations rose a little. Alas, the expectations were not met; the noodles were fine, the flavour and consistency were okay, but for the price, I wouldn’t bother. So far, the Shanghai Garden noodles are the cheapest, most flavoursome and the noodle with the best consistency. I still have the premium brand SuperNoodles to try, but I’m a little noodled out just now, so I’ll have to get back to you! I’ve not been very well this last week or so, and in the last 48 hours, my throat has been painful to the point that it’s pretty uncomfortable to eat solid food. Today I headed along to my local Tesco to pick up the essentials for a poorly person (hubby was at work so I had to go it alone): paracetamol, ibuprofen, Strepsils, orange juice, smoothies, soup, noodles and ice cream. Not the healthiest shop by a long shot, but when I’m feeling lousy, the last thing I want to do is cook proper meals. Juice, smoothies and soup are my vitamin boosts (along with a daily multivitamin) and noodles go down easily without hurting my wee throat too much. The supermarket trip nearly wiped me out, bit the most tricky part was buying noodles! The cost of a packet of noodles varied from just 11 pence for Tesco Value brand and 69 pence for SuperNoodles. That’s more than 600% more! Okay, it’s just pennies, but if you’re buying more than one pack, it could really make a difference. After much deliberation, I settled on buying four different types of noodles, with the intuition of establishing whether or not there truly is a difference. Today I had the Tesco Value brand chicken flavour instant noodles, priced at 11 pence per pack. I followed the instructions on the pack easily. They softened well and were ready to eat in just three short minutes. They tasted fine and the texture was okay. They were close to the consistency of any other noodle I’ve tasted. The down side is that they only had chicken flavour; there was no alternative. Back to school… After 11 years! Yes it’s true. I left school 11 years ago and set off for Art School. A year later I dropped out as I wasn’t happy. I guess I took longer to ‘find myself’ than some of my peers. Since then, I’ve probably found myself several times over: trained in Graphic Design at a vocational college, landed a job as a junior designer, quit job as a junior designer due to lack of progression in a small company, worked in retail, been promoted to manager, stepped down, and now I’m working as a sales person. Anyone who has worked in retail will appreciate that it’s not the most rewarding job. In fact, at times, it’s downright insulting! I’m an intelligent girl, but I’m flighty. So guess what? I’m at a careers crossroad again. I’ve flirted (a lot) with the idea of beauty school or teaching. I’m pretty set on the latter, so tomorrow, I’m going to school. I have a friend who works in the local high school and has kindly agreed to allow me to shadow her and sit in on her classes. Eeeekkk!!! I haven’t stepped foot in a school since the start of the millennium (class of 2000 y’all!). So I’m pretty nervous, but also bubbling with excitement. Before you say it though, I am well aware of the shortage of teaching jobs at the moment, but think I may have a plan (top secret, y’know). My budgeting efforts will have to (at least) double as I head into 4 years of full time education. Bring on the beans on toast! Views like this are priceless. 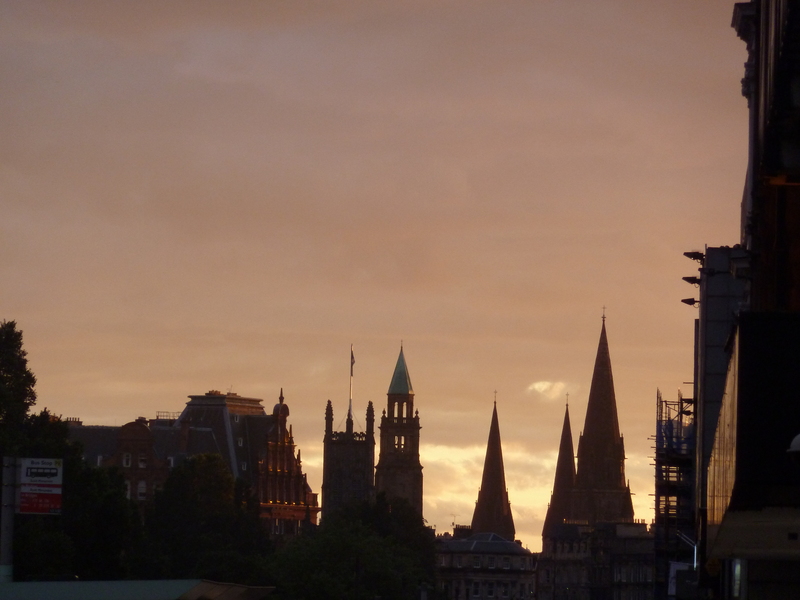 I was lucky enough to snap these pictures of beautiful Edinburgh on my way home from work. I really do love this city! I’m back! I’ve been off on annual leave from work for my 29th birthday, and despite my intentions to increase the frequency of my posts, this is actually my first post in over 10 days! Poor show, I apologise. I had a great week off including a wee night out on the town with friends. I managed to blag my way into a club for free, just because it was my birthday (hey, it’s worth asking! 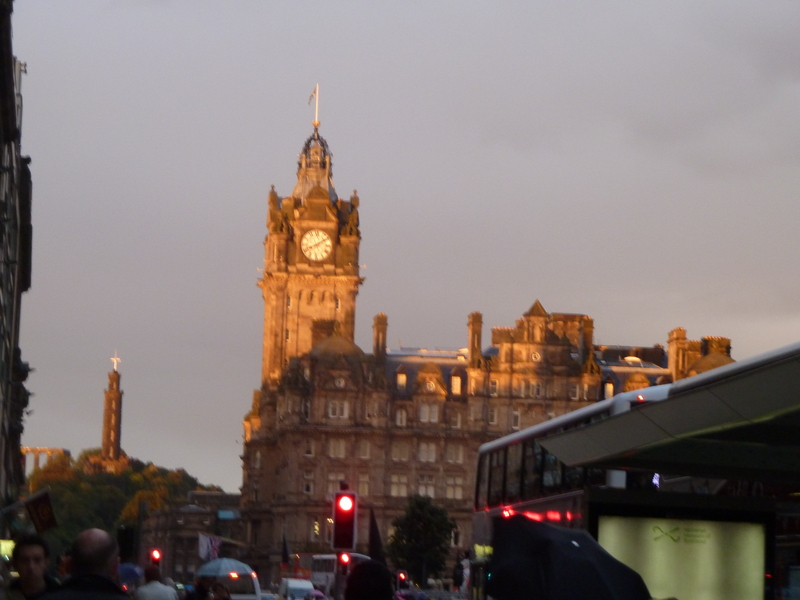 ), and also managed to charm my lovely husband into picking me up (taxi fare would be around £40, kerrching!). I was pleased to see a bit of sunshine on my actual birthday (Monday), which I enjoyed on the beach at Burntisland, Fife. Mid week I headed south with one of my sisters and her 3-year-old daughter for a camping trip. 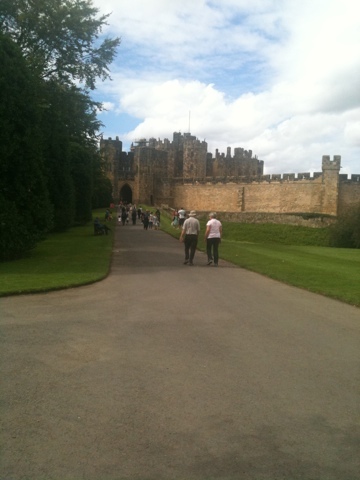 We had a great couple of days visiting Alnwick Castle & Gardens and Lindisfarne. Entry to the castle & gardens was the greatest extravagance at £22 per adult (eek!) but only a penny for kids under 5 (phew!). Visiting Alnwick is really best done on a nice day as the gardens are a great attraction and the castle is just as amazing outside (if not more so), than inside. The castle is the setting for some of the scenes of Hogwarts in the Harry Potter movies. As an avid Harry Potter fan, this was the most exciting part of the trip for me. I spent the most part of the visit buzzing around searching for parts of the castle that resembled scenes from the film. Older kids can take part in Harry Potter inspired ‘flying lessons’, which seemed to involve racing brooms hobby-horse style. Then there’s Knights Quest, where children can dress up as knights and maidens and make magic wands, coats of arms and clay tiles. These activities are included in the admission price for the castle, so they’re worth doing to get the most out of your money. 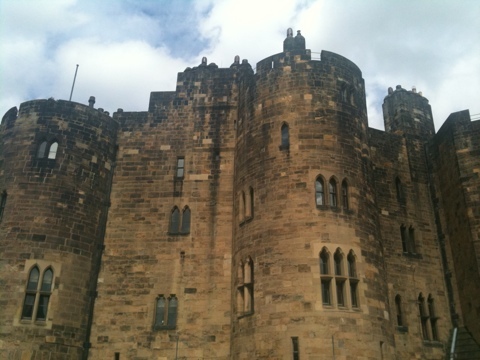 We ventured into Alnwick town in search of somewhere to eat (ideally fish & chips!). We stumbled upon a little Italian called Caffe Tirreno. It was reassuringly busy and looked child friendly, and the prices on the menu in the window were very appealing. Two 11″ pizzas, two soft drinks and a slice of chocolate fudge cake (happy birthday to me! ), all for just just £20.50. Bargain! On the way back we did pass Carlo’s Fish & Chips, which also looked very inviting. The following day we drove over Lindisfarne Causeway to Holy Island. The island itself is very picturesque with an interesting history too. Unfortunately, my 3-year-old niece wasn’t interested in history so we took a stroll around the village, along to the grounds of the castle, where she enjoyed rolling down hills, and to the coast, where we searched for crabs in rock pools. We camped at the Barn at Beal, which is also a cafe and visitors centre. They have a small area for tents near the entrance. It was great value at only £9 per night for all three of us. The only down side was that there was only one male and one female shower which each had a toilet in the cubicle. This meant that if someone was using the shower, then the toilet was not accessible for anyone else to use. That aside, it was great value for money, and I would probably stay there again, rather than paying the £20+ that some other campsites in the area were charging. Also on site is a birds of prey centre. We didn’t have time to go, but other kids on the campsite seemed to have enjoyed it. 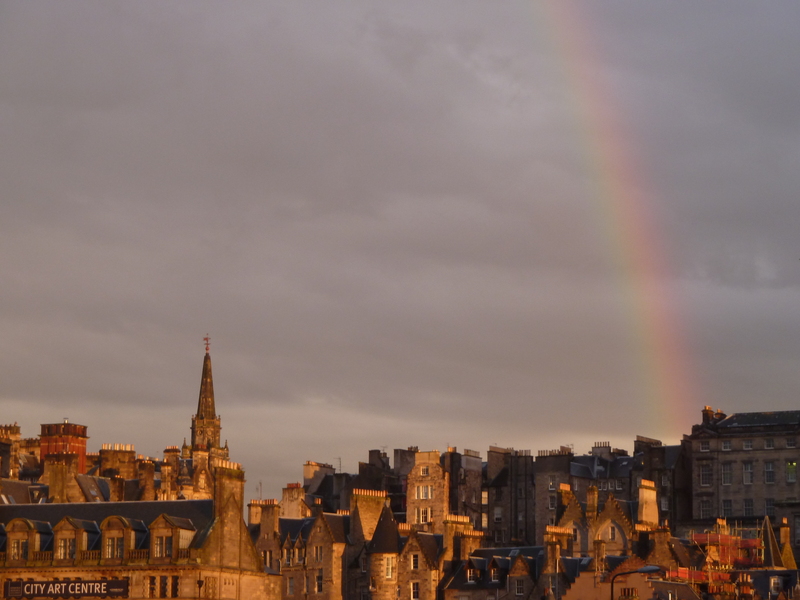 I’ve also been enjoying the Edinburgh Festival this week, but I’ll have to leave that for my next post. Like most people in the UK, I’ve been reflecting on the riots that broke out in London, Liverpool, Birmingham, Manchester, Salford, and the many other acts of violence and vandalism in many other British cities and towns over the last week. I’m still feeling a sense of disbelief; how can this possibly have happened in the UK? I wasn’t directly effected, living in Scotland, where, for once, we are considered to be the civilised ones! I have spent a lot of time in London though (a long-distance relationship in my late teens had me there every other weekend) and every time I visit, my heart swells a little bit with excitement and, perhaps pride is the word, or love for the city. What I mean to say, is that I feel connected. My parents grew up in South East England, and made their marital home in Ealing, where my oldest sister was born. I wasn’t just a tourist type when I visited either. My visits to London in my younger years included time spent in Brixton, Streatham, Clapham (one of my sisters lived there for a while), Peckham, Elephant & Castle, Croydon… Most of these places have been struck by violence from a so-called lost generation. The happenings over the past few days have really got me thinking. There is a complete a lack of community in Britain today. Young people feel isolated, whilst some older generations feel threatened. There doesn’t seem to be a solution. Today’s youth have grown up in a society that is obsessed with consumerism. A teenager without a laptop, mobile phone or games console is practically unheard of. So is it so surprising that so many people seized the opportunity to get something for nothing? Articles in several newspapers and on blogs have all pointed out that, in some ways, the greedy youths looting all over England parallel the MPs claiming excessive sums of money to kit out their homes. Great example? Why should the already wealthy MPs be have these sums of money covered by the government, whilst others struggle to pay rent or buy food? I do not, by any means, condone the theft, violence and damage caused by the rioters, but perhaps if the whole nation was less materialistic, then there would be less envy. Fewer people waiting to get their fair share. This country needs a shake up. We need to pull together and work on our society. We need to stop worshiping ‘things’ and start respecting each other. Young people are the future of Britain and they need to be nurtured before they can thrive. The culture needs to change. These are my thoughts and opinions. I’m not really a political person but the recent goings-on have hit a nerve. I’m on a quest to save money in a society that seems to revolve around material possessions. It’s difficult so stop wanting things that just about everyone around you already has. The temptation to spend or acquire consumer goods needs to be removed; Britain needs to change. I need to curb my spending to avoid the downward spiral of debt. In order to do this, I must address my needs versus my wants, and be disciplined enough to resist. It’s not easy, and it’s not always successful, but it’s all I can do for now.